As the most populous county in New Jersey, Bergen County is the place to be! This scenic area has an extensive park system that provides a perfect mix of outdoor activities and easy access to the New York City metropolitan area. With its convenient location and family-friendly atmosphere, you get the best in city living when choosing to relocate to Bergen County, New Jersey! When planning your next move, you need a trusted Bergen County moving company on your side! At Booth Movers, we specialize in all areas of relocation, from full-service household moves to cross-country corporate relocations. With award-winning accreditations and an affiliation with Atlas Van Lines, there is no job too big or too small for our expert Bergen County movers! Our Bergen County movers are dedicated to quality and exceptional service, making us one of the most trusted names for Bergen County moving services. Whether you are going down the street or to a new country, our Bergen County moving company is equipped to handle all of the details and provide you with the most seamless relocation experience possible! Residential Moving – From small apartments to large estates, there is nothing that our expertly trained movers can’t handle! Household Moving – Our Bergen County movers offer everything from basic transport to full-service packing and moving services to make your relocation a stress-free process. Local Moving – Nobody knows the northern New Jersey region better than our experienced Bergen County moving company! Long-Distance Moving – Planning a long-distance move is a breeze when you let Booth Movers handle the details! Interstate Moving – To make moving to a new state a seamless process, our Bergen County movers will help you navigate each stage of the process. Full-Service Moving – Our Bergen County moving company will carefully pack your home and transport your valuable belongings and heavy appliances. International Moving – From customs clearance to global moving coordination, we can make your international move a seamless experience! 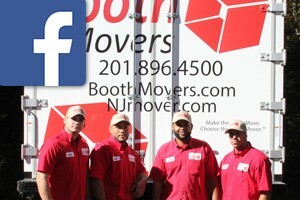 Are you ready to learn more about the premier choice among Bergen County moving companies? Give us a call today, or fill out our online form to request your free, no-obligation moving estimate!